The 104 Compadre Camp Knife is among the Compadre Series of outdoor tools from Buck Knives that boasts the latest in design and innovation. 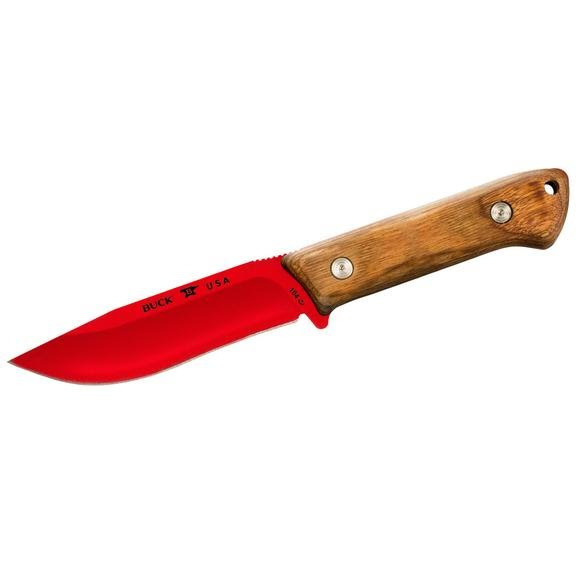 Designed and engineered with the outdoor enthusiast in mind, the camp knife offers full tang construction and a heavy-duty, stylish Heritage Walnut Dymondwood handle. The 104 Compadre Camp Knife is among the Compadre Series of outdoor tools from Buck Knives that boasts the latest in design and innovation. Designed and engineered with the outdoor enthusiast in mind, the camp knife offers full tang construction and a heavy-duty, stylish Heritage Walnut Dymondwood handle. The well-thought-out design makes for easy carry, while the red powder coat blade adds style and uniqueness to your outdoor collection of tools. Sized right for any job, the camp knife is a must have for the outdoor enthusiast.